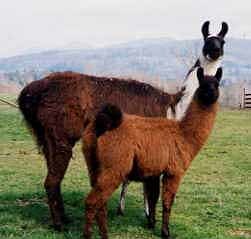 Her first cria was Chimborazo, a nice male who is a wonderful packer. She is a good mother and had plenty of milk. Tall, very correct, brown and white, with medium length fibre, she was bred to Rain Dancer and had a lovely warm reddish-brown male cria named Tap Dancer on September 11, 1999. He is shown at seven months with his mother in the lower picture above. We will re-breed her to the stud of your choice. For more information on Majesta or any of our other animals drop us an e-mail.